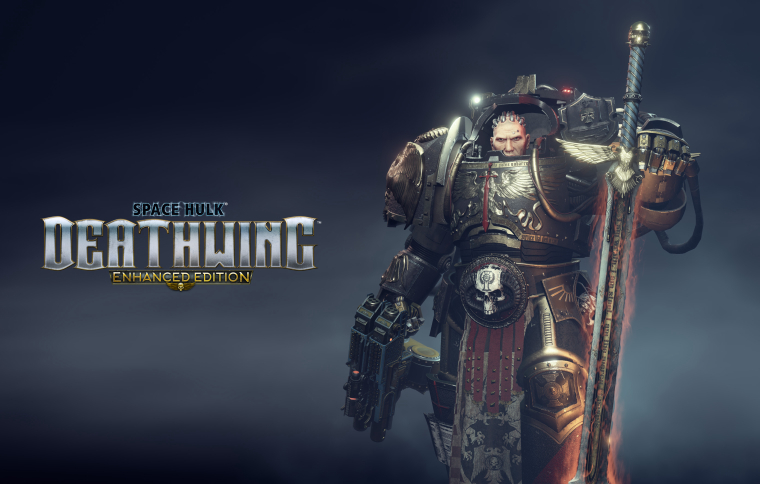 As we get closer to the release of Space Hulk: Deathwing - Enhanced Edition, we'll showcase some of the new content coming to PS4 and PC May 22. In your missions in the Space Hulk Olethros, solo or online cooperative multiplayer with up to four players, the Enhanced Edition brings a deep class customization to unlock armour and weapon skins, attachments, perks and more for aesthetic and gameplay customization. One of the sets of armor available for all classes is the Angels of Vengeance Terminator armor. The Angels of Vengeance is a Loyalist Chapter of Space Marines and a Second Founding Successor Chapter of the Dark Angels. Created during the Second Founding, the Angels of Vengeance have retained the original black colour-scheme of the Dark Angels. Regarded as some of the most stubborn fighters of the Imperium of Man, these Space Marines have risked the future of their chapter many times, by throwing themselves in the most dire situations, and refusing to retreat even when their chances were almost nil. The Angels of Vengeance embody the stubborn devotion of the original Dark Angels Legion above all else, with this trait bordering on single-mindedness. It is also said that the Angels of Vengeance are unrelenting in their persecution of foes to the Imperium, maintaining not only an extreme hatred of Xenos but an even more fanatical disdain for traitors and Chaos Space Marines. The Chapter's future has been put in jeopardy several times, beginning with their depletion in the Forgotten Wars. More recently, in the aftermath of the Siege of Apolis their losses were so heavy that the Chapter was forced to spend a century rebuilding itself before it could be deployed for battle once more. The Chapter, like all of the Unforgiven, has close ties to the Dark Angels. The Chapter has two Companies that are dedicated to hunting the Fallen and are modeled after the Dark Angels' Deathwing and Ravenwing. They are the Terminator-armoured Dreadwing and the mobile Raptorwing Companies. We can't wait to see you in the Space Hulk with your friends as a squad of Terminator-armoured Dreadwing! I'm not sure it will be easy to make available for players, sadly. I'll ask. Camera/Photo modes are becoming more common in games nowadays. Given how great Deathwing looks, it definitely deserves one. I'd like to see a screenshot tool or ability to view saved replays etc i mentioned this years ago. When me and my friends played the original ghost recon we would spend a lot of time watching and reviewing our games from cool camera angles. All there needs to be is a "free camera" and a "save replay" button at the end of missions and a menu item to view saved ones. Groovy. So. How do we get the sword as an offhand weapon paired with a bolter? It'd be soo much fun. Like others, I would spend forever creating awesome looking shots. The main "skin" of the armour doesn't impact the gameplay, although you can add adornments, displayed on the armour, and they have gameplay impact. @netheos yes thank you Netheos, that's very cool! But when i saw the great picture in tweeter of the terminator from angels of vengeance chapter, i was wondering if, for example, a specific class of this chapter would be abble to uses bolter mark IV and a powersword. Would be really amazing! Will the Enhanced Edition allow you to play coop while still seeing the story portions of the game such as cutscenes? I heard that the original game stripped that stuff out when playing multiplayer and that really bums me out because I want to play this through with a friend but I don't want to miss the story elements. @Netheos I'd really appreciate a response on this! That's exactly the problem. I want to experience the story with my friend. We'll be missing out on the cutscenes entirely and would have to find them on YouTube or something afterwards if they aren't present in coop. We're 40k fans so we're in it for the story as much as the gameplay.